We Say Goodbye to Sr. Carol Quinn, O.P. Sister Carol Quinn, a Dominican Sister of San Rafael for 62 years years, died peacefully at Our Lady of Lourdes Convent on Tuesday, September 27, 2016. Virginia Marie Quinn was born in 1930 in Stockton, California and was educated by the Dominican Sisters from first grade through college. At Dominican College (now University) in San Rafael, she earned an undergraduate degree majoring in biology and minoring in chemistry, and a master’s degree in biochemistry. After entering the convent, Sister Carol completed her teaching credential. For almost fifty years she was a dedicated educator who taught science, math and religion to high school and college students in San Rafael, Monterey, Napa and Vallejo. She cared deeply about her students, supporting them personally as well as academically. 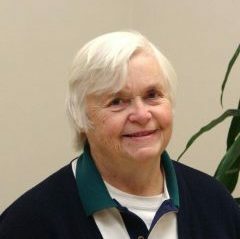 After retiring from the classroom, Sister Carol lived in Stockton and served as the archivist at St. Joseph’s Hospital. The sisters with whom she lived over the years enjoyed her cooking as well as her quiet ways of making life in the convent easier and smoother for everyone. Sister Carol was preceded in death by her parents, Jim and Jenny Quinn, and her sisters, Barbara Holm and Frances Quinn. She is survived by her nephew, Jim Holm, her niece, Chris Moore, her great-nephews Matt and Brian Moore, and by her Dominican Sisters. A funeral Mass will take place on Tuesday, October 4 at 10:00 a.m. in the Gathering Space at Dominican Sisters Center, 1520 Grand Avenue in San Rafael. Burial will follow at St. Dominic Cemetery in Benicia. Memorial gifts in honor of Sister Carol may be made to the Retirement Fund, Dominican Sisters of San Rafael, Development Office, 1520 Grand Avenue, San Rafael CA 94901. I FIRST MET SISTER CAROL QUINN IN THE FALL OF MY SENIOR YEAR AT DOMINICAN. IT WAS HER FIRST YEAR AT THE THEN COLLEGE. I NEEDED CHEM 1a FOR MY BIOLOGY MINOR. THE FIRST DAY OF CLASS, SISTER CAROL GAVE ALL OF US A BRIEF PLACEMENT TEST. SHE CALLED ME IN AND SAID “IF YOU WERE ANYTHING BUT A SENIOR AND NEEDING THIS CLASS FOR YOUR MINOR, I WOULD TELL YOU TO DROP IT.” FOREBODING WORDS, BUT WORDS OF A CHALLENGE I WAS GAME FOR. SO EVERY EVENING WHEN SHE HAD DUTY IN FANJEAUX, I WAS THERE FOR A TUTORING SESSIONS AS SHE GUIDED ME THROUGH CALCULATIONS AND ABBREVIATIONS THAT WERE FOREIGN TO ME. I THINK I EARNED A B+ AND THE COMMENT ON THE REPORT CARD WAS…READY FOR 1B. I GOT OUT WHILE THE GETTING WAS GOOD. LECTURING EXCITEDLY ABOUT AN ENVIRONMENTAL PROBLEM OR AN ESOTERIC PROTEIN MOLECULE. REGARDLESS OF WHERE YOU SEE HER—WHAT YOU SEE IS A COMMITTED TEACHER ALWAYS READY TO LISTEN TO AND SUPPORT STUDENTS BOTH INSIDE AND OUTSIDE OF CLASS. BUT HER KNOWING WAS NOT LIMITED TO HER STUDENTS OR FACULTY; IT EXTENDED TO YOUR RELATIVES AND FRIENDS, ALWAYS ASKING AFTER THE FAMILY AND REMEMBERING NAMES AND GENERATIONS. THE GOSPEL SPEAKS OF THE MANY ROOMS IN GOD’S HOUSE, IN THE HEAVENLY HOME. SISTER CAROL LIVED MUCH OF HER RELIGIOUS LIFE IN PLACES SOME MIGHT HAVE STRUGGLED TO CALL HOME. BUT WHETHER IT WAS RISING EARLY TO BAKE BREAD FOR THE SISTERS IN VALLEJO AND NAPA, CRAFTING A SUNDAY NIGHT DINNER FOR DOMINICAN CONVENT, OR GATHERING DORM STAFF OF PENNAFORT AROUND A WARM MEAL—SHE KNEW THE POWER OF THE DINING TABLE TO PROMOTE CONVERSATION AND COMMUNITY. AND SHE WAS ALWAYS THE LAST TO LEAVE A PARTY, WASHING THE LAST DISH, PUTTING AWAY THE CHAIRS, RESTORING ORDER FROM THE CHAOS OF THE FESTIVITIES. SHE CARED DEEPLY FOR HER FAMILY—FOR HER SISTER BAR, BROTHER IN LAW HARVEY AND FINALLY FRAN. THE QUINN SENSE OF HOSPITALITY EXTENDED TO BAR AND HARVEY’S HOUSE ON CALIFORNIA STREET IN SANTA CRUZ—A WARM, INVITING HOME THAT SISTER CAROL SHARED WITH SISTERS AND FRIENDS. SHE TOOK DELIGHT ESPECIALLY IN ALL THE QUINNS AND MOORES—NEPHEWS JIM AND GREG, NIECE CHRIS AND HUSBAND TOM. BUT MATTHEW AND BRIAN—YOU MUST KNOW WHAT YOU MEANT TO HER, HOW SHE RELISHED YOUR GROWING UP, YOUR ANTICS AND MISCHIEF, HOW PROUD SHE WAS OF YOU AND YOUR GROWING FAMILIES. ARMED WITH HER IPAD SHE WOULD DELIGHTEDLY SHARE THE LATEST PICTURES. WHAT IS SISTER CAROL’S LEGACY FOR ALL OF US—WE WILL EACH HAVE OUR OWN GIFT THAT WE TAKE FROM OUR FRIENDSHIP WITH HER. BUT I THINK IT MAY BE REVERENCE FOR ALL CREATION, RELISHING LEARNING AND KNOWING, NURTURING DIALOGUE AND COMMUNITY. IN HEAVEN SHE WILL HAVE PREPARED THE MEAL AND SET THE TABLE—AND HER FAMILY AND FRIENDS WHO HAVE GONE AHEAD WILL SIT DOWN FOR A WONDERFUL MEAL. AND SINCE SHE PASSED ON FRAN’S BIRTHDAY, I AM SURE SHE BAKED A CAKE.